TAMPA, Fla., March 19, 2019 (GLOBE NEWSWIRE) -- SubscriberWise, the nation’s largest issuing CRA for the communications industry and the leading protector of children victimized by identity fraud, announced today the recommendation from the Florida Attorney General’s Manager of Complex Financial Fraud, William Featheringill, to Enterprise Holdings’ fraud victim David Howe to contact private legal counsel to pursue remarkable ‘fraud upon the court’ (https://www.floridabar.org/the-florida-bar-journal/fraud-on-the-court-as-a-basis-for-dismissal-with-prejudice-or-default-an-old-remedy-has-new-teeth/) allegations, as well as sworn testimony exposing state and federal UDAAPs among other demonstrable crimes permanently recorded on Florida official public records taken under oath of perjury. 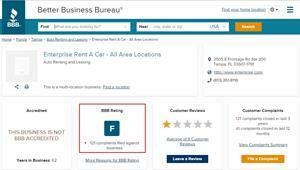 With a mountain of customer complaints, the Better Business Bureau says Enterprise Rent A Car is 'Not BBB Accredited' and deserves a failing grade of 'F'. According to an audio recording obtained by SubscriberWise, the specific advice to contact an attorney was communicated following Mr. Featheringill’s diligent review of voluminous and unimpeachable evidence of attempted felony grand theft, perjury, obstruction, collusion, suppression of a police criminal investigation, witness tampering, fraudulent court exhibits, and conspicuous Florida statutory violations among others. The seasoned fraud investigator, who has more than 15years of collective experience working with the Florida Attorney General, reluctantly broke the AG’s silence to victim Howe after months of unanswered correspondence which documented critical components of the extraordinary systematic car rental theft racket beyond reproach. The AG’s office, again according to a comprehensive review of monumental evidence spanning more than two years by SubscriberWise and other investigators, including a number of Florida state law enforcement bureaus, have remained tight-lipped in face of the overwhelming crime evidence because of justifiable concerns over the ‘ripple effects’ that will undoubtedly follow once the theft tactics are broadly exposed to legal firms, insurance companies, state AGs, the FTC and CFBP, Congress, and, most importantly, innocent consumers across the nation who have been victimized by the complex and systematic crime racket for years and decades in this nation. “I’m frankly relieved to hear from the AG’s Office at long last,” stated David Howe, SubscriberWise founder and Enterprise Holdings crime victim. “And I’m grateful for the advice Mr. Featheringill provided. For the record, it’s advice that I was already keenly aware; the engagement with very resourceful legal counsel is indeed in the pipeline and includes involvement with another fraud victim. “The good news,” Howe added. “I can now see the light at the end of the tunnel. And despite the stunning ‘fraud upon the court’ with the remarkable and wholly substantiated due-process debacle, including flagrant perjury by an ‘Officer of the Court’ in Judge Archie B. Hayward Jr.’s Lee County courtroom, it’s all a blessing in disguise because the criminal activity so thoroughly documented can never be undone. And that’s another way of proclaiming that the fraudsters -- including those who have systematically attempted to collude, conceal, and obstruct justice to protect the massive revenue flowing into public and private coffers -- they are implicated and there’s zero chance they will escape exposure and consequences for this undeniable and long-standing USA fraud racket. “Yes, I have no doubt, after state and federal fraud investigators fully expose the complex crime racket, for the first time in this decades’ long complex fraud and theft machine, the citizens of this nation – and the world frankly – we finally have the ‘treasure trove’ of evidence so overwhelming, so undeniable, so unimpeachable, so beyond reproach…the innocent citizens and visitors who’ve long been victimized will now have the hard facts to pressure lawmakers to exact a decisive end to the theft that’s perpetrated with frequency and ease by corrupt corporations with a relentless ‘zeal to steal’, concluded crime victim and survivor David Howe. Related: Revenue Protection – Police get ‘marching orders’ to ‘muddy, scrub, and suppress’ the official and substantive LCPAPD criminal investigation: https://youtu.be/VgZJQGU4q5Y.